E.M. Magic Swf2Avi FAQs-- How to convert swf to iPhone? Q. How to Convert Swf to iPad, iPhone, iPod, Apple TV E.M. Magic Swf2Avi? 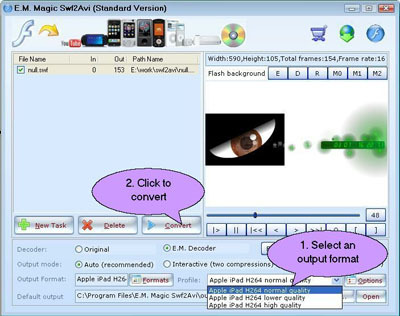 A. E.M. Magic.Swf2Avi is an excellent utility that can convert Swf to Apple video including iPad, iiPod, iPhone, Apple TV, etc. It provides the total solutions that many other flash conversion tools can't solve. Such as video and audio asynchronization, loss of frames, audio distortion, and the processing of swf files with internal or external Flash video. With the increasing improved functions, E.M. Magic Swf2Avi can let you easily and fully enjoy the original effects of your swf files on your iPhone. Do you want to enjoy your iPhone life? Don't hesitate, E.M. Magic Swf2Avi is the best choice for you. 1. Use audio-extracting method to keep 100% of the original sound when convert swf to iPhone. 2. No skipped or lost framei in the process of convert swf to iPhone. 3. Accurate audio and video synchronization. Here you will know how to convert Swf to iPhone. mpeg4 with the help of E.M. Magic Swf2Avi. step 1.Click "add files" to add files you would like to convert. step 3. Select one kind effect in the combobox dialog of profile. Then click "convert" to start converting. Few seconds later, you can enjoy wonderful movies in your mobile.